I have ordered a Dual H-Bridge 12A continuous (30A peak) Polulu motor driver shield for my upcoming (first time ever, a 1.2m long tank made of wood) robot project. Knowing the Arduino can handle max 5V I did make sure to make it a bit lower. But my wonders go to the fact that I am suspicious that connecting the motor driver and Arduino to the same power source isn't a great idea? Or am I paranoid? Is there a formula to find the most effective R1 and R2? Do I have to worry about current spikes? Any other things I could miss in this simple-yet-suspicious circuit? Also, if I wanted to simulate any possible scenario, which components should I choose in the circuit to keep it as simple as possible (for simulating in Multisim 13)? Using a voltage divider as a power source for almost anything is a Very Bad Idea. The actual voltage supplied to the load will vary with the load current. I expect that the current drawn by an Arduino will be Much, Much Greater than is drawn by your 10 meg resistor, so the voltage will be much less than you expect. 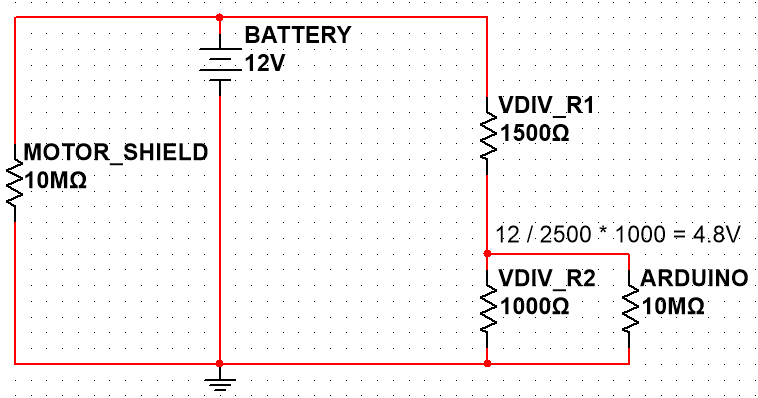 You should use a DC-DC converter (AKA switching regulator) to drop the 12 volts down to 5 for the logic. A linear regulator such as the LM7805 could also be used, if the 5 volt current demand is low, but a linear regulator will waste the excess power as heat. The standard arduino boards ( ng, uno, duo, micro ) have a built-in regulator to which you can connect the 12V. Although a linear regulator is not efficient, it's unlikely to be significant compared to the power taken for the motors in your tank. A 1.2m tank could be quite heavy. I hope the fish enjoy it. Not the answer you're looking for? Browse other questions tagged arduino power-supply dc-motor voltage-divider motor-controller or ask your own question. 19.5V to 15V - what's the best way to lower the voltage? Will this power source and setup work? Will this N-Channel Mosfet work as high-current motor controller?